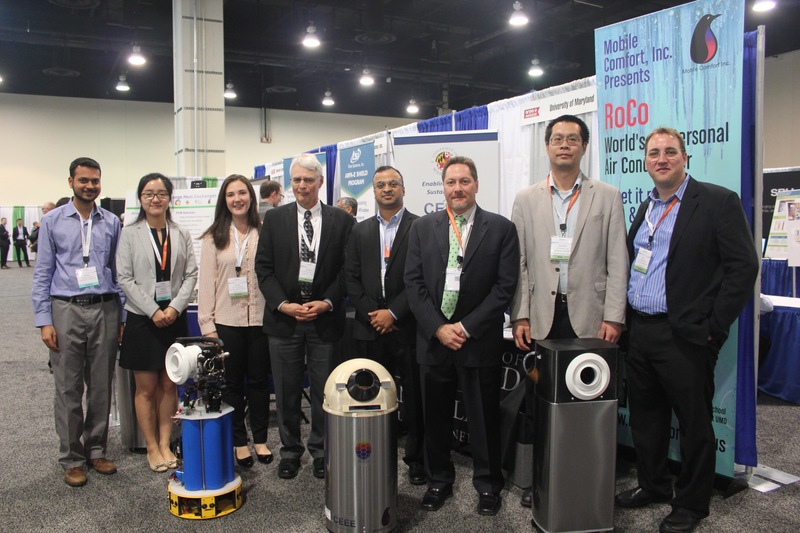 Engineers from the University of Maryland have partnered with Oak Ridge National Labs and CITY@UMD to create a robotic personal conditioning device (RoCo) which was selected for demonstration at the ARPAE Energy Summit this week. It is one of the world’s first personal air conditioning systems that requires no wires or ventilation while in use. The portable machine, developed as part of ARPA-E’s Delivering Local Thermal Amenities (DELTA) program, has a “smart” nozzle that can track user movements and direct a cool or warm air stream exactly where the user wants it. The device operates for up to 4 hours at which point the unit needs to be recharged, notably at a time when the user is asleep or during off peak work hours. Stave indicated that he sees a prominent market for RoCo in senior care facilities, outdoor and recreational use, manufacturing plants, and older buildings where heating and cooling are difficult or have many different areas of temperature gradients. A graphic rendering for smaller units has been drawn up. Currently the engineers are working to reduce the costs of the manufacturing in order to better market the machine. Stave indicated that the goal is to reduce the production cost to $150 per unit and estimates that approximately 100,000 could be sold annually world-wide.